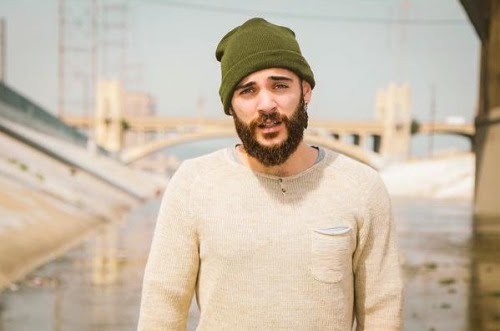 Jon Bellion.. is.. "the most INTERESTING MAN in the WORLD". Okay, jk, that honor belongs to Mr. Dos Equis (whose real name is actually perhaps the most UNINTERESTING NAME in the WORLD^) but Jon Bellion does have his own interesting and intriguing idiosyncrasies as well. He has the beard that I imagine Ron Swanson would grow if he ever ditched the signature 'stache. But then he also has the pop-perfect vocals of Adam Levine. Aaaaand I think that makes him probably the only person in the world who I can compare to the lead singer of Maroon 5 and Duke Silver. So big props to Jon Jon. He's 100% original... Except for his musical influences, who he lists as Kanye West, John Mayer, and Coldplay. Pretty mainstream and cliche there. But not everything has to be so underground and indie-hipster ppl! An ALL-CAPS band name does not a good indie song make. We praised Bellion for his lyrical prowess (is that adjective innately feminine? If so, sry, Jon! Didn't mean it like that!) back in December for his all-too-real track "Human". And on his newest single, "Woke the F*ck Up", he continues to pair his signature quriky, catchy production and relatable lyrics. For example: "we live in an age where everything is staged/ where all we do is fake our feelings". Woah, Jon Bellion. Hit the nail on the f*cking head. Defintiely an off-the-beaten-track sort of hidden gem to get your weekend started. All you have to do is wake dafuq up and press play already! ^It's Johnathan Goldsmith. Such a common and blasé name overall. The irony.